Would you like to get free beauty and lifestyle products delivered to your doorstep every month? If you do, then Saladbox is for you. 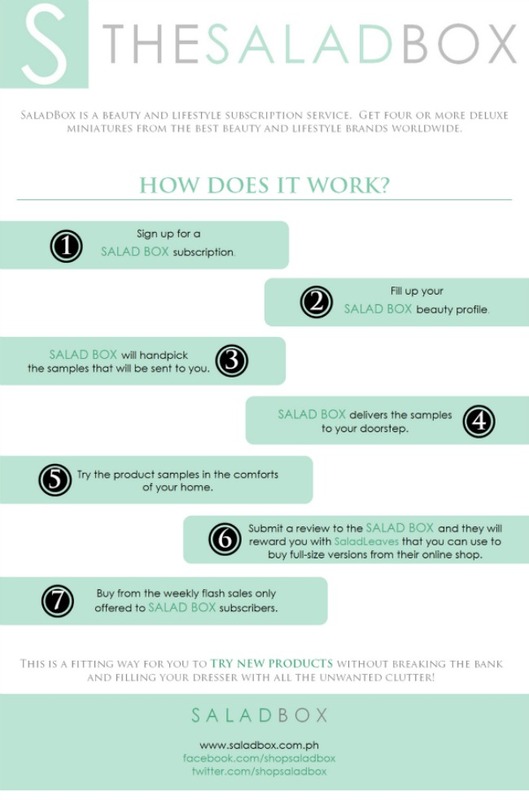 Saladbox is the first and only beauty and lifestyle box subscription in the Philippines. For only P500/month, Saladbox subscribers will receive four or more lifestyle and beauty product samples amounting to at least P700/month. Saladbox is currently in partnership with a lot of international and local beauty and lifestyle brands. And lastly, to show their appreciation for their sunscribers, Saladbox will hold exclusive weekly flash sales where you can purchase awesome deals at unbelievably low prices. You can use either cash or salad leaves earned from publishing your reviews of previous products received from your Saladbox. Saladbox will start accepting reservations for subscription slots starting September 8, 2012, 8:00PM Manila Time. They will send you a link to their subscription application form once it’s your turn to subscribe. And since subscriptions are limited and on a first-come, first-served basis, make sure you guys log on at 8pm tonight to get first dibs! and FOLLOW on Twitter for updates! Oh so this is what I've been seeing online. Will check their site. Sounds so good. Nice. So, this is like Pinoy version of Glossy Box? I think this is cool subscription for those PH-based beauty vloggers out there.